I'm quite fond of looking at beautiful spreads in interior magazines. I particularly like and draw inspiration from the laid back New England style with its crisp whites mixed with blues and reds and star motifs! I sometimes implement a few ideas in our own home (or try to). 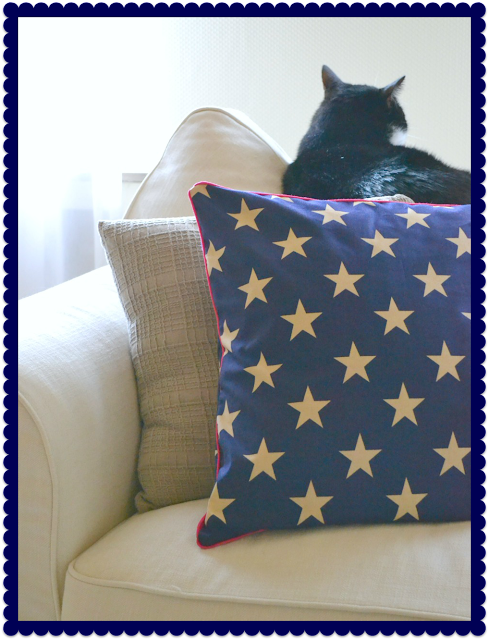 When I received a bolt of this terrific STAR fabric in navy/cream I immediately set to work and made a pillow for the couch. 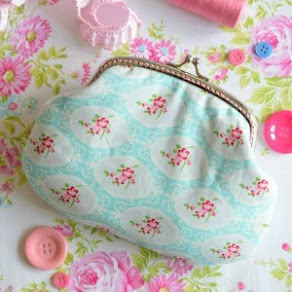 Of course it wouldn't be my own if I didn't add some bright detail - in this case fuchsia pink piping! Ich schaue mir immer gerne die Interieurs und das Styling in Wohnzeitschriften an; insbesondere gefällt mir der lässige New England Stil mit viel Weiß, Blau und Rot sowie Sternenmotive! Manche Ideen setze ich bei uns im kleinen Rahmen um. Versuche ich zumindest. Der obige STERNENstoff in Navy/Creme passt hervorragend zu diesem klassischen, amerikanischen Stil. Das Kissen war schnell genäht. Als Farbtupfer habe ich eine fuchsienfarbige Paspel mit eingenäht! 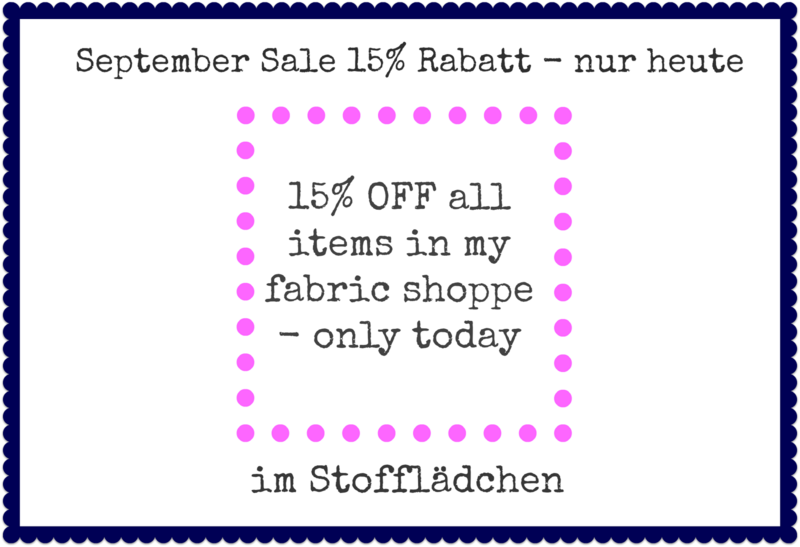 Speaking of fabrics, there's an END OF MONTH SALE in my fabric shoppe. 15% OFF of everything! Only today. 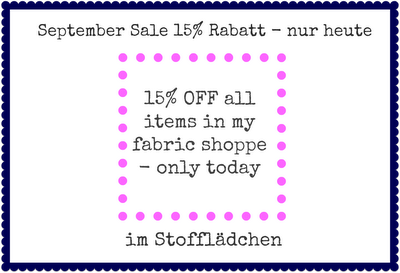 Apropos Stoffe...im Stofflädchen gibt es HEUTE 15% RABATT auf ALLES. Nur heute! ...preferring to lay on top of the backseat cushion as usual. ...wie immer macht er es sich lieber auf dem Rückenkissen gemütlich. Liebe Duni, danke dir für deine lieben Kommentare bei mir drüben, ich freu mich immer sehr! 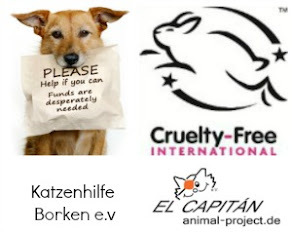 Ein Kissen ist bezaubernd, besonders die Paspel in fuchsia :) werde demnächst dich mal in deinem kleinen Onlineladen besuchen kommen, muss mal bissl stöbern :) hab ein schönen Sonntag, liebe Grüße, Ka.Ho. Sammy may not be impressed but I really like the pillow. 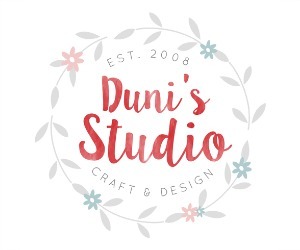 Hi Duni! Happy Sunday :) I love color blue so your newly dressed throw pillow impressed me. I also love cardigans, especially with that diamond and checkered prints. Enjoy the season and have a great week! As always, your pillow is beautiful! The pink is a neat touch, even if Sammy doesn't seem to appreciate it. I am a huge fan of cardigans, too. I really adore your pillow! The red piping was a great touch. The pillow is fabulous! I love how you did the piping in Fuchsia instead of red! I love putting color on in the cold, dreary months. It seems to brighten my mood. :) Sammy is funny facing the wall. One of my cats does that too, but I can not figure out why! ha ha! and with his back to the pillow! I think it's beautiful! The pink is so fun! love the stars and your color combinations! Love the pink combined with navy color! Have a great Sunday to you! It's Monday already here and I'm ready to teach! I love pink with blue. Very classic!